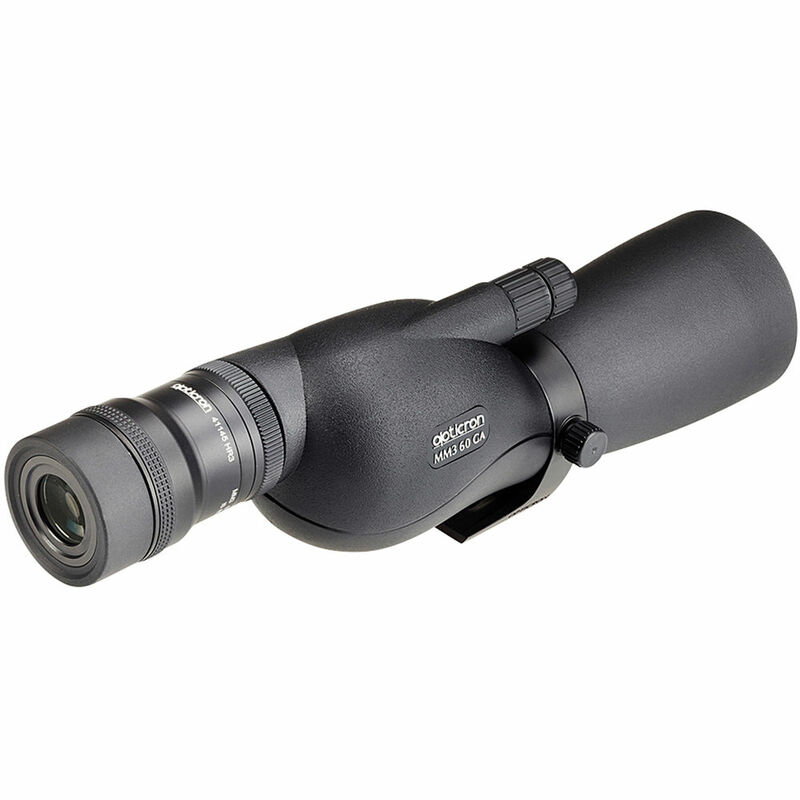 Combining their compact fieldscope with a powerful zoom eyepiece, the straight-through viewing Opticron MM3 60 GA 16-48x Spotting Scope gives users a complete rig for viewing birds, game, and other subjects. All that is required is a reliable support system. Designed with the principals of "smaller, lighter, brighter, and sharper" in mind, the straight-through viewing Opticron MM3 GA 60mm Travelscope is built with fully multi-coated optics and measures under 10" in length. The coatings ensure accurate color rendition with improved clarity and contrast, while the larger 60mm objective lens boosts its light-gathering performance in challenging conditions such as at dawn and dusk or when trying to see into wooded areas under dense canopies. The short form factor lets you hand hold it at lower powers for convenient glassing-on-the-go without a support system. This iteration of the MM3 GA is offered here without an eyepiece for those users who already own Opticron eyepieces and are looking to upgrade their scope. It is compatible with Opticron's full range of HDF and SDL eyepieces to give you a wide variety of viewing angles and magnification to choose from. The 2-speed focusing system features an 8:1 reducer mechanism to allow for fast coarse and precision fine focusing, while the straight-through viewing configuration makes finding and tracking subjects faster and easier versus angled designs. For optimum eyepiece orientation, the tripod collar rotates up to 90° in both directions. A 1/4"-20 mount makes it compatible with many tripods, quick release plates, and other popular support systems like window mounts. Designed for Opticron's 60mm and 70mm IS R spotting scopes, the HR3 Zoom Eyepiece delivers 16-48x on the 60mm model and 18-54x on the 70mm version. To limit eye strain long-duration observation sessions, it maintains a long and comfortable eye relief through the zoom range, starting at 20mm at low magnification and moving to 16mm at high power. It features anti-reflection fully multi-coated optics to complement those used on the spotting scopes, and a twist-up rubber eyecup allows for comfortable use with or without eyewear.